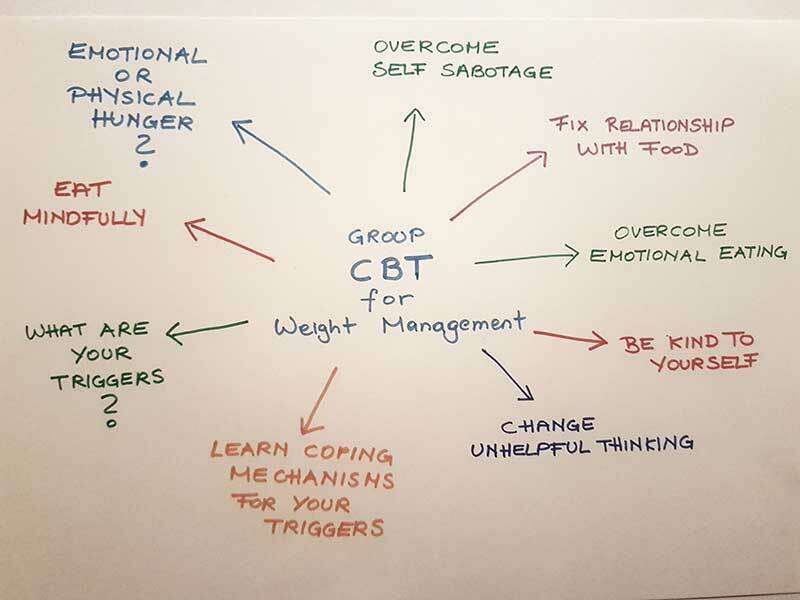 On the Mind over Body programme, we look at how your thoughts and how your behaviour undermines your weight loss goals by using Cognitive Behaviour Therapy (CBT). CBT looks at how your thoughts, behaviours and feelings all connect. Making changes to how you think in a given situation will help you to change your behaviours and how you feel. On the programme I help clients to find alternative thoughts and behaviours that will enable them to successfully reach their weight loss goals. In this blog I want to share with you examples of the most common unhelpful thinking styles. Do you recognise any of those thoughts?? Thinking only in Black & White or All or Nothing is unhelpful, as it won’t allow you to have a balanced view. Not many things in life are black or white and in order to have balance, thinking in shades of grey will allow you to be satisfied with being ‘good enough’ and accepting it is ok not to perform at your very best all of the time. I have to lose all of my extra weight; there is no point in aiming to lose only some of it. What’s the point of walking for 10 minutes – I have to work out at least 1 hour for it to count. I will aim to lose 10% of my body weight to begin with, this will motivate me to set new goals. One hour in the gym would be great, but today I only have time for a quick walk. It still counts as exercise and the fresh air will help blow away some cobwebs. You are only noticing the negative things around you. You are filtering out the positive things. Are you seeing everything through “gloomy specs”? Discounting your achievements and focusing on failures. I only went for a walk and didn’t go to the gym. I didn’t lose weight this week, it’s not fair. I am glad I went for the short walk. It still kept me moving and active. I didn’t lose weight this week, but I have stuck to plan 90% of the time which will help me lose weight in the long run. It doesn’t matter if I eat this, I’ll go for a walk later to work it off. I’ll just have one slice of cake and then I’ll stop. Think about how things usually turn out when you have those type of thoughts. I have thought this in the past, but I never end up working the excess food off. I usually don’t stop once I have cake, so I won’t have it, I’ll have coffee/tea/fruit instead. Emotions can lead to overeating, poor food choices and weight gain. I am so angry – I have to have chocolate. I’m bored; I am going to see what’s in the fridge. I am so angry/bored/stressed – food is not going to make me less angry. What have I put in pace for myself – what is my coping mechanism that I have learnt? How am I going to feel tomorrow if I give in to my emotions now? In the module on emotional eating you will learn how to find alternative ways of thinking and how to deal with your emotions. When you are having a difficult day and you find it hard to stay on your healthy food plan and find yourself eating cake/drinking wine etc. I am stupid, I just can’t get the hang of this. I am a failure, I always give up after a few weeks. I am having a bad day today, that’s ok. I am doing the best I can at the moment. I will take it a step at a time. Being overly broad and coming to conclusion based on one single fact, not taking other factors into account when making a decision. I can’t exercise, because I have a bad knee/back. I am not sure if I can eat this fat, let me find out. I’ll never be able to give up my toast and jam in the morning. This plan won’t work, I will fail, I always fail at everything. I will try not to have toast and jam one day this week, and see how that works for me. I will gives this plan a try and do the best I can. I have succeeded in other areas of my life (think about examples), I can do this. My host won’t like me if I say no to her scones, and everyone will think it strange if I just drink water and say no to wine. Try a cost/benefit exercise to help find a more balanced way of thinking. I will eat yummy food and drink my favourite wine. Self deluded thinking is believing for a moment what you know not to be true. I cheated this morning so I might as well keep cheating all weekend, because today is a write-off! I don’t care about my weight, so I will eat what I want! I went off plan this morning for one meal, but that’s ok, sometimes I need to have food that is not on my healthy eating program – this will help me not feeling deprived in the long run. I am back on plan with my next meal. I care about my weight loss, my reasons why I want to lose weight are………. Should statements put pressure on you, elicit feelings of guilt and do not change unhealthy weight management behaviours. I should be able to manage this food plan. I must go to the gym today. Replace the word ‘should’ with will/could/might etc. I will learn more about my new food plan. I might go to the gym later, I will feel better afterwards. Do you expect to be rewarded for your efforts? Do you feel bitter if you are not? Have food and alcohol rewards been a part of your life? I stayed on plan all week – today I deserve a treat. I have lost 10 pounds – I deserve something sweet. I stayed on plan all week, I reward myself with a manicure/new book/etc. I have lost 10 pounds, I have reached my goal and will have a massage/pedicure/etc. In order to manage your weight, you need to identify and change distorted/unhelpful thinking. It will take time and be patient with yourself. Record your sabotaging/unhelpful thoughts in your journal, with your thoughts and behaviours and see if you can come up with alternative more helpful thoughts. In our group sessions we will look at those thoughts more closely and you have a chance to identify your own unhelpful/sabotaging thoughts.